This year's edition of Return To The Batcave has offered its participants a myriad of musical surprises. Almost a "garage" climate of Wroclaw CRK stage moved listeners to the 80's so faithfully that it would be difficult to find a more suitable space for this type of event. Although the CRK itself is not in a particularly safe part of Wroclaw, thankfully the closed off space saved the participants of the festival sparring surprises with the residents of the district. Friday’s set of concerts started with Polish Alles formation, creating within a climate of blunt, sometimes even "dry", cold wave electronics, warmed up the audience with strong beats and good energy. After them, we experienced another pride of Polish alternative scene - Joanna Makabresku, a true legend in the genre. Although a significant number of listeners were our neighbors from the West border, they also nodded their heads in appreciation. A truly powerful sound and incredible energy came from the gentlemen of Mescaline Babies, an Italian band playing in climates of death rock / post-punk - in the opinion of listeners they were the "love at first hearing". Psychedelic images were displayed behind their backs, to that the extremely dramatic performance of the singer were creating an indelible, incredible feeling of musical performance. The Last Day Of Jesus from Slovakia maybe did not stun with scenic image, but musically evoked what‘s best in the classics of the genre. The simplicity of musical form and good lyrics were, on one hand, a nod to history, on the other – provided the Slovaks a good deal of individualism. Type of music played by the French Popoi Sdioh can be described as quite psychedelic batcave, but it was not because of music that the concert was the one I remembered most. The performance won’t be forgotten thanks to... socks, stockings and tights, which the artists decided to throw at audience with a request that they are to be distributed and thrown back to the musicians! Kilograms (clean and laundered, fortunately) of underwear were hanging everywhere - from instruments, microphone cables hanging from the ceiling, musicians, listeners and it is possible that also on gaffers. Everywhere. It is hard to deny that it provide extra fun to the participants and no one hardly felt offended, being able to push hard knot of stockings in any direction. After the French the stage was again taken over by Italians, this time The Spiritual Bat. Although musically they didn’t bring anything new, but somewhat milder than their predecessors and their catchy melodies allowed a breather for the audience just before the performance of the main acts. Although the whole set of performances was much delayed due to airport problems of aforementioned main acts, patience paid off, and very much so. The greatest interest was given to the delayed Luminance, which the audience literally shoved back to the stage to continue playing. Their performance was so good that nobody wanted to let them go, demanding again and again more encores, and the band itself has confirmed its size and the right choice of the organizers for making them the star of the evening. Saturday began with a performance of the German Totenwald, paying homage to shades of classic punk straight from the 80's. Singer, charismatic and effectively presenting herself, has provided an unforgettable experience, both musical and aesthetic in general. After that Voyvoda from Bulgaria appeared and the audience, mesmerized by the voice of the singer, rocked rhythmic in tempos of nostalgic at times, cold wave sounds. Polish Hatestory gave the show of an amazing sense of style and climate in such a way that not only the Polish fans will remember it. Listening to them, our thoughts relocated to the beginning of the golden age of Jarocin, the very sound resembled the one enjoyed by Lombard or Manaam - also in a layer of strong, almost aggressive vocals. A pleasant surprise was the formation BA.13 from France, once they started with the strong, vigorous blow - they did not stop until the end. Clothed in a sterile lab suits, like those for collecting evidence from the crime scene, they quickly got rid of them due to temperature which they created themselves. If not for the specifics of music festival (which always have bigger or smaller delay), the audience certainly would not let them off the stage so quickly. Heavily anticipated Ascetic, despite the fact that he kept level and climate of their own music, lost slightly this time with the sound system during their performance - sound wall prevented many listeners to participate in a concert fairly, from beginning to end. However, the performance was very popular and provided a good musical variety – from energetic punk jumping the climate morphed into a deep, dark sound. Then Cemetary Girlz proposed another hard blow which they recreated into something of their own, surprisingly lively and most importantly - individual. A big plus were thy lyrics in French, the mother tongue of band’s members – it gave the sound an entirely new quality and a certain kind of... truth, let's say. The culmination of the evening was the performance of greatly anticipated Soror Dolorosa, the star, whose performance we experienced during Castle Party 2013. The charismatic voice of Andy Julia and powerful sound of music circulating throughout the otherwise small stage space of the CRK created an amazing atmosphere, which is difficult to come by in open-air concerts. The performance also gathered the greatest interest, and after the performance ended, the musicians had fun with the audience. The festival was finished with sets from some very good DJs who provided fun... until ten in the morning on Sunday. 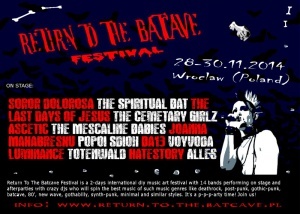 There was no special surprise to meet with the most enthusiastic opinions on Return To The Batcave Festival from participants, who asked for more and more often. The organizers decided to go out and meet the expectations already on March 28 when a concert of Polish cold wave legends - Pornografia and the German XTR HUMAN will be held. And then, the next edition of the festival itself will be held on 16-18 October 2015. As patrons invite you all to come. I sincerely recommend the next edition!